A chemist tried to prepare compound A from benzene via Friedel-Crafts alkylation and instead produced compound B. Why did this happen? How could the chemist prepare compound A? Friedel-Crafts alkylation is prone to carbocation rearrangement. 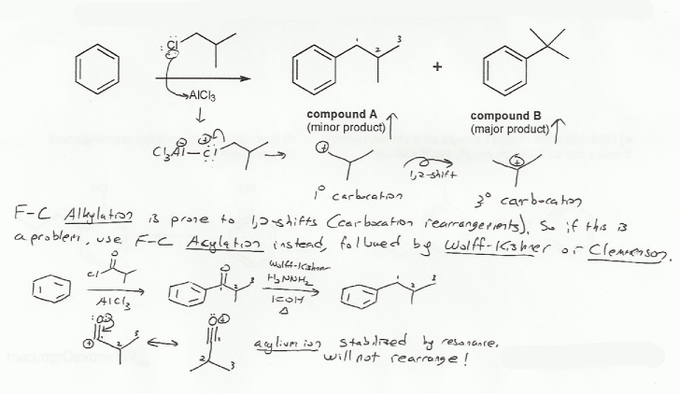 In this case, alkylation produced a 1º carbocation which rearranged to a 3º carbocation, leading to compound B. We can avoid this by instead doing Friedel-Crafts acylation. The intermediate in acylation is the acylium ion, which is stabilized by resonance and so won't rearrange. But after the acylation reaction we have to get rid of the carbonyl (C=O) group, so we do a Wolff-Kishner reduction (N2H4/NaOH, heat). MendelSet practice problem # 594 submitted by Matt on July 9, 2011.